Crazy quilts were popular in Victorian times, when ladies of the day would stitch together small fabric scraps to make a larger piece of fabric for use as a quilt top. The seams of the pieced quilt would often be embroidered with ornate or fancy stitches, resulting in a much treasured work of art. You can make a modern version of the crazy quilt to use as a pillow front, or make the pillow entirely in crazy quilting, if you wish. Although you could hand-embroider the seams, now is also your chance to put those embroidery stitches on your sewing machine to good use. First, select your fabrics. Although you can mix and match fabric scraps, it’s wise to use fabrics of similar weight, although lots of different textures or designs can be interesting. The contrast between a small floral pattern, and a broad stripe, for instance, can often work well in a crazy quilt. Iron any pieces that are wrinkled or that have fold lines, then cut your fabrics into small pieces. Try cutting some odd shapes with straight sides – for example, a large triangle could meet or join a smaller rectangle, a square, or a rhombus. There’s no right or wrong way to piece together a crazy quilt, so let your sense of color and creative design be your guide. Lay fabrics out on the table and experiment until you have look you like, then begin sewing. Sew along one side of two pieces, right sides together, then sew another two pieces together and so on, finally joining the pairs into your final fabric. Take each sewn pair and open the fabric out, wrong side up. Fold both edges of the pieced seams to one side and, if necessary, iron to hold in place. Turn the fabric right side up, and top stitch near the seam (using a fancy embroidery stitch on your machine) so that the folded seams on the other side are caught by the embroidery stitches and permanently held down on one side. You may leave some seams plain, if you like, using the embroidery only where it will make a nice contrast. Begin to stitch the sewn pieces together until you have a mosaic of fabric large enough to make our pillow front. Cut the pieced fabric to the desired size of your pillow. Cut a backing of the same size – this could be another mosaic of fabric, so the pillow is reversible, or a single piece of fabric. Place both pieces of fabric right sides together and sew all around, leaving an opening about five inches long. Mitre the corners, as shown at right, by clipping off the corner, close to the seam line. Use the opening to turn the pillow right sides out. Stuff the pillow with fibrefill, or another type of pillow stuffing, filling to a comfortable level. Slip stitch, or blind stitch, the opening closed. 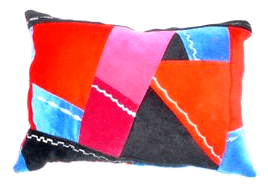 Your crazy quilt pillow is now complete.